Set the chicken breast side down on a cutting board. Using poultry shears or sturdy kitchen scissors, cut along one side of the backbone; then cut along the other side and remove it. Freeze the backbone for making chicken stock another day. Open the chicken up like a book and remove any excess fat. Turn the chicken over and push down on the breasts to flatten. Remove the skin if desired. Marinate chicken overnight or season with a dry rub. Oven Roasting: Preheat oven to 400˚F/200˚C. 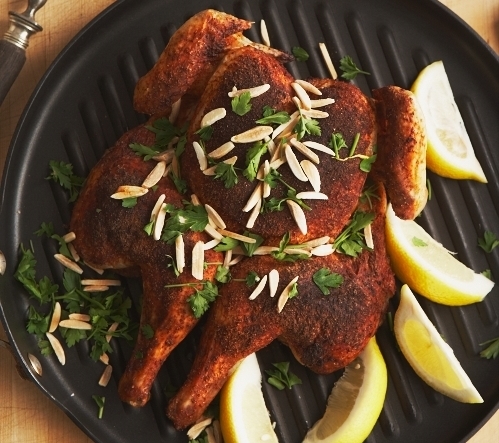 Put spatchcocked chicken cut side down on a broiling pan or on a rack in a roasting pan. Insert an oven proof digital thermometer into the breast. Roast until thermometer reads 170˚F/77˚C. Roasting time ranges from about 10 minutes/lb for larger chickens to about 15 minutes/lb for a 3 lb chicken. Remove from heat once the thermometer reaches 170˚F and let stand 15 minutes. Grilling Using Indirect Heat: Preheat grill to medium-high (400˚F-500˚F/200˚C-260˚C). Insert an oven proof digital thermometer into the chicken breast. Put spatchcocked chicken cut side down on the grill and turn off the burner under the chicken. Grill until the thermometer reads 170˚F/77˚C. Grilling time ranges from about 10 minutes/lb for larger chickens to about 15 minutes/lb for a 3 lb chicken. Remove from heat once the thermometer reaches 170˚F and let stand 15 minutes. If you doing a smaller chicken, why not cook a second one at the same time? This way you’ll have leftovers to make quick meals.